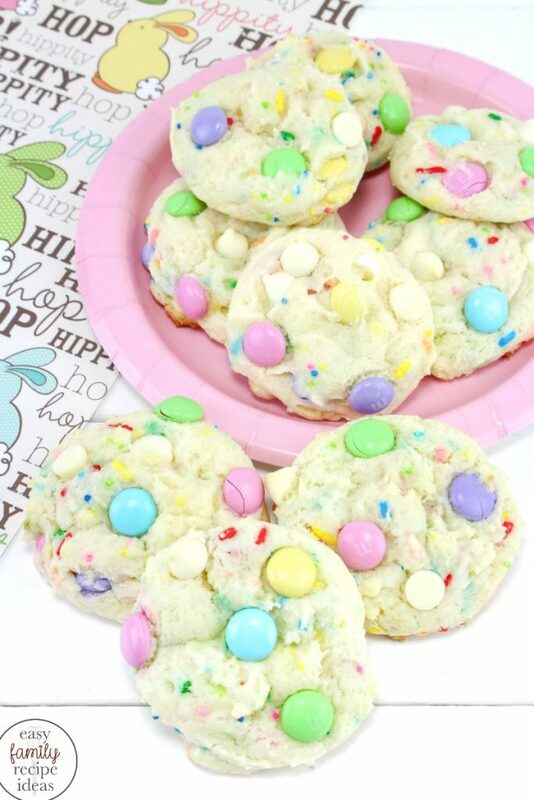 These Spring Funfetti Cake Cookies are soft and delicious. 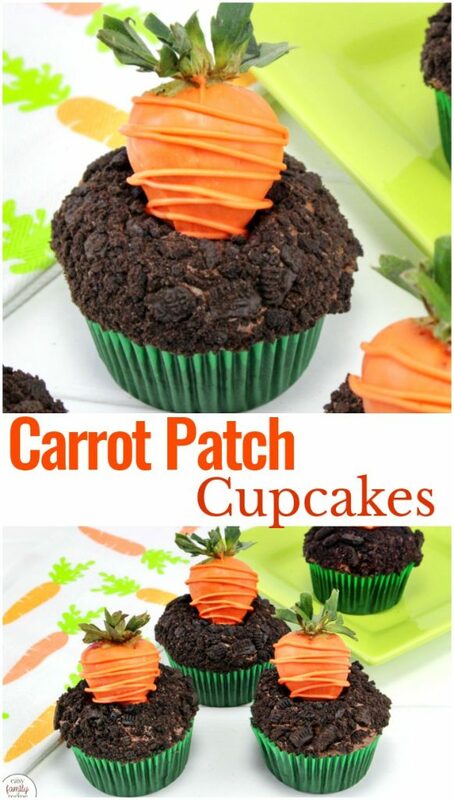 Make a batch or two for the kids on Easter for the perfect snack. 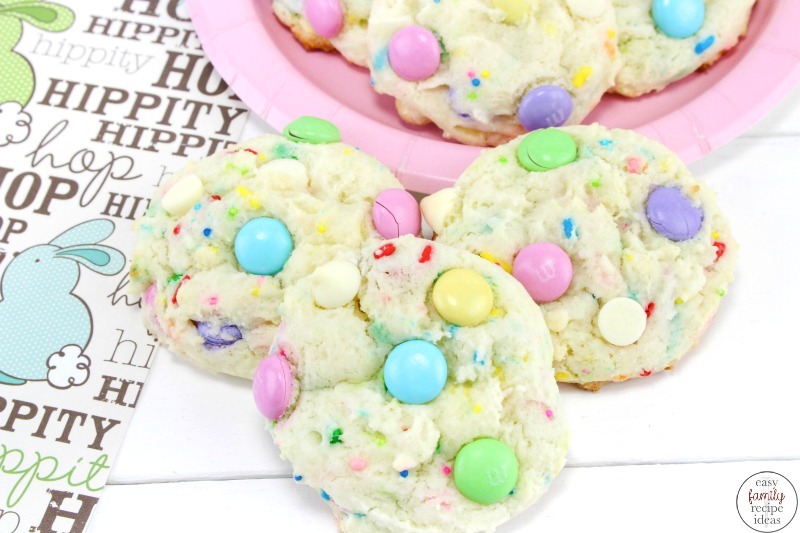 Easy-to-make Easter M&M Cookies taste so good every bite is a tasty treat in your mouth. I love springtime, the colors, the smells and everything seems pretty. 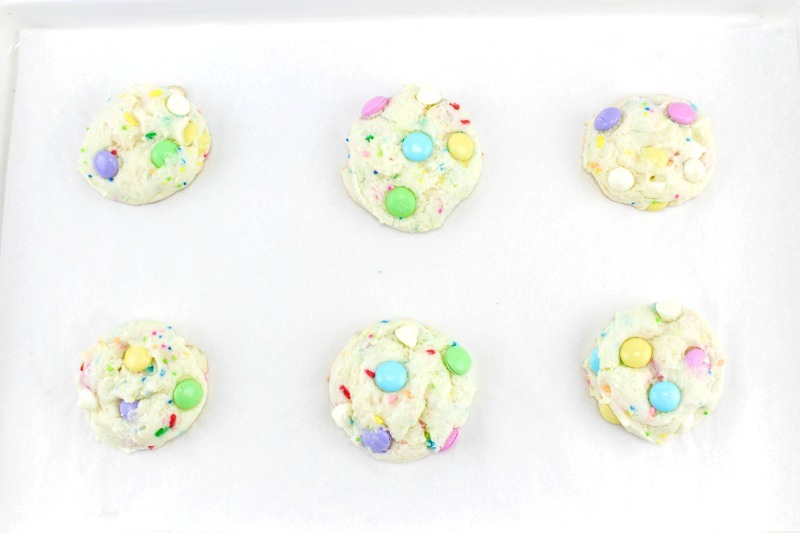 So when I saw the Easter M&Ms at the store, I knew it was time to make a batch of delicious M&M Cookies. Whenever we are at the bakery or even Panera my kids get googly eyed and excited when they see the colorful cookies in the display. Well I knew I could make those cookies at home and make them even better. 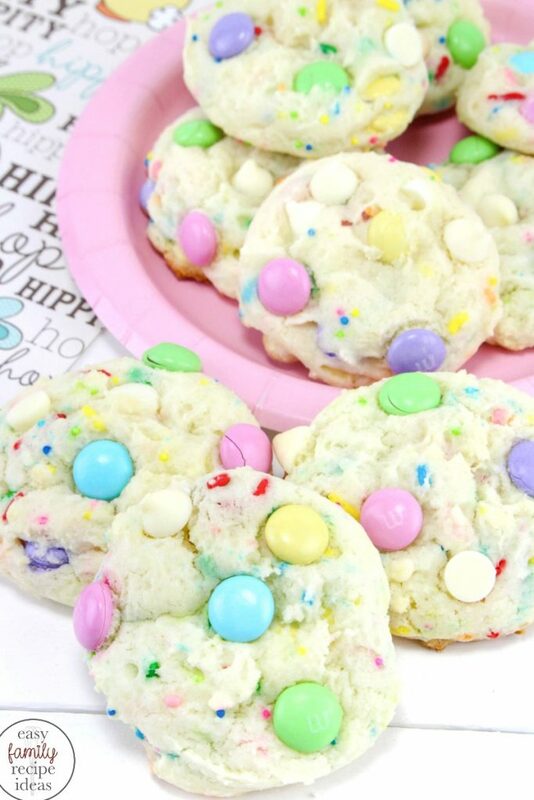 Oh yes, These Funfetti Cake Mix Cookies, are fluffy, soft and the white chocolate chips take these cookies to the next level. Yum! 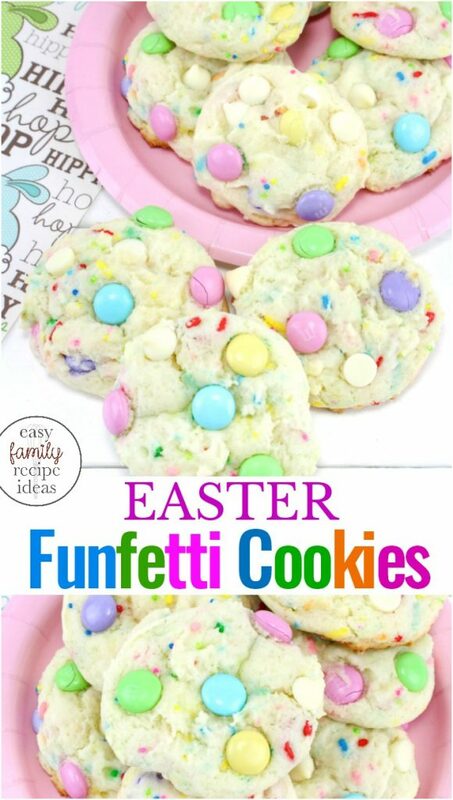 What you will need to make these Funfetti Cake Mix Cookies is in this picture below. However, I have it displayed in a recipe list form to print out towards the bottom of the page. Another reason to love these cookies is it only takes a few ingredients, one bowl and a box of cake mix. Easy recipes are the best! 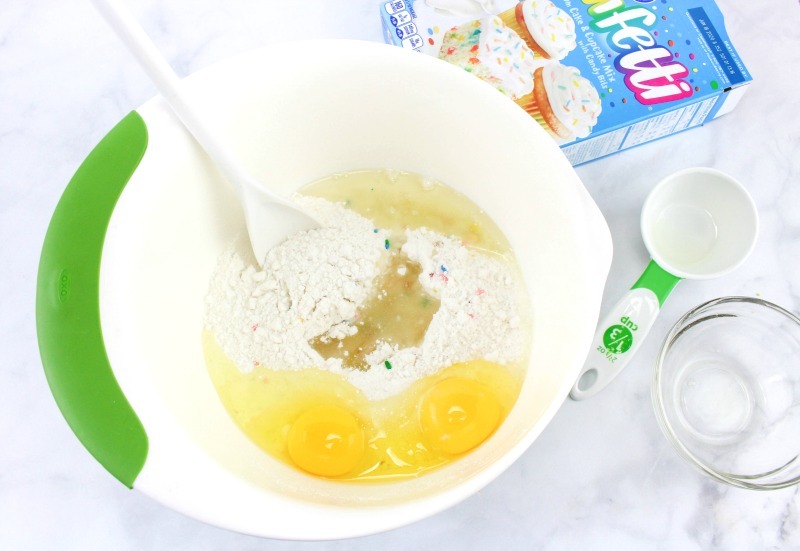 In a large bowl, add the dry cake mix, oil, and eggs. Stir with a spoon until all ingredients are combined or use a mixer and mix for about 1 minute. 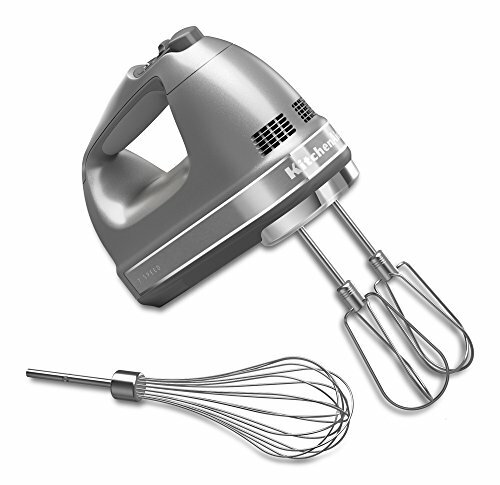 It is a sticky and thick batter, so a mixer is easier. 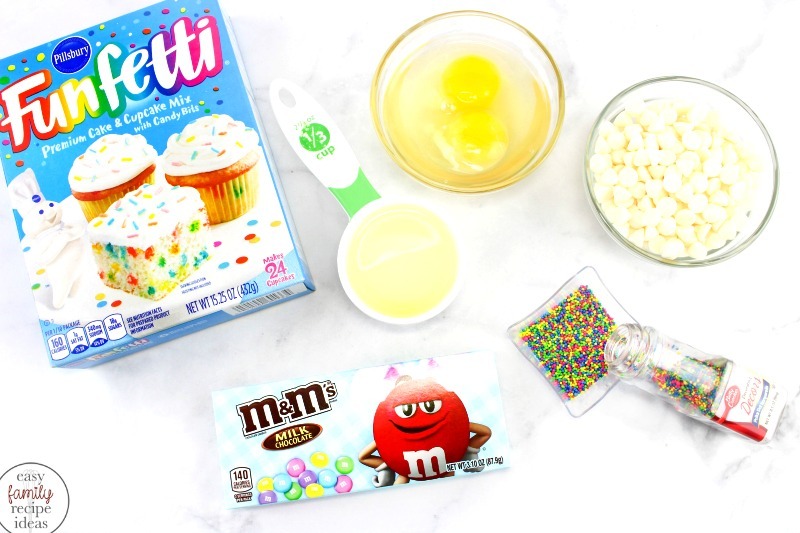 Add the M&M’s, white chocolate chips, and nonpareils, and mix it together with a spoon. 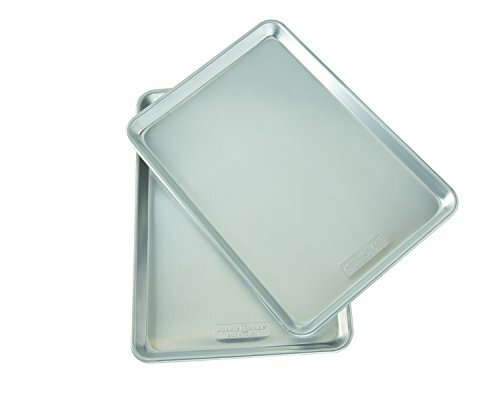 Using a cookie scoop, scoop your dough and place on a parchment lined cookie sheet about 2 inches apart. 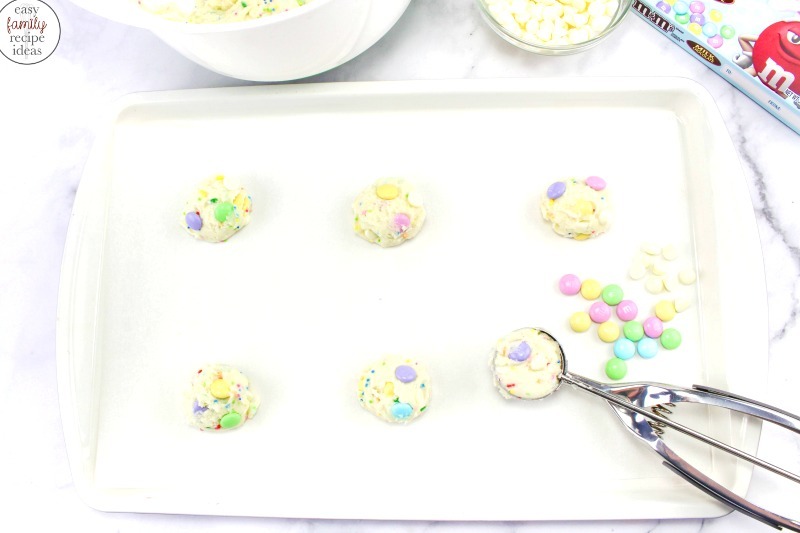 You can press additional M&M’s and white chocolate chips into the cookie ball if you’d like. We love adding a little extra goodness into our cookies, but it’s optional. 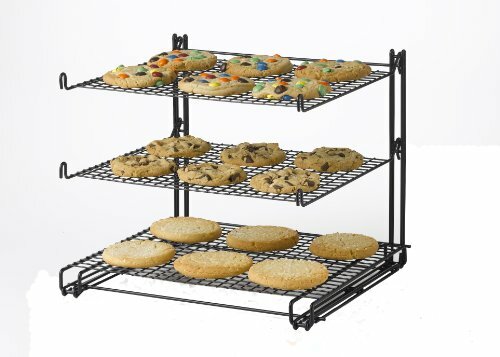 You’ll want to bake your cookies at 350 degrees for 8-9 minutes. 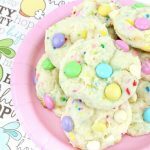 Spring M&M Cookies are yummy Funfetti white chocolate chip cookies with lots of pastel colored M&M’s for Easter, brunch or a special treat for the kids! 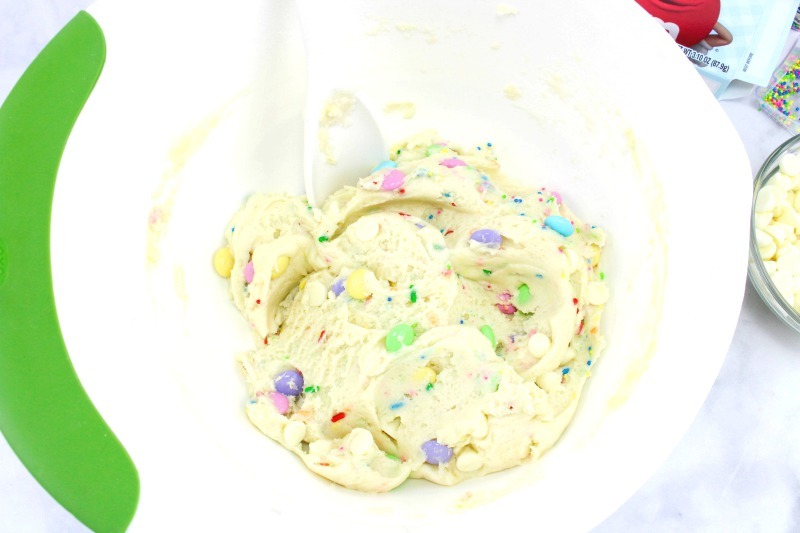 Add the M&M’s, white chocolate chips, and nonpareils, mix with a spoon. 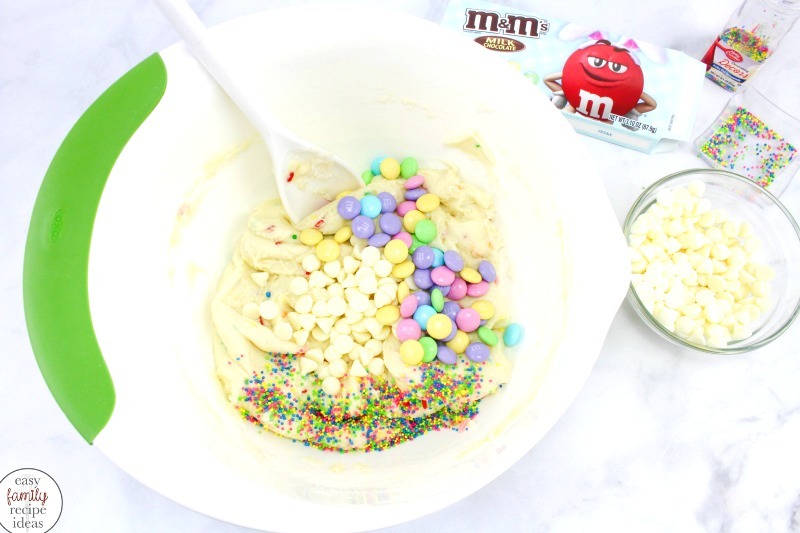 Press additional M&M’s and chocolate chips into the cookie ball if you’d like. Bake for 8-9 minutes or just until the edges are slightly golden brown. 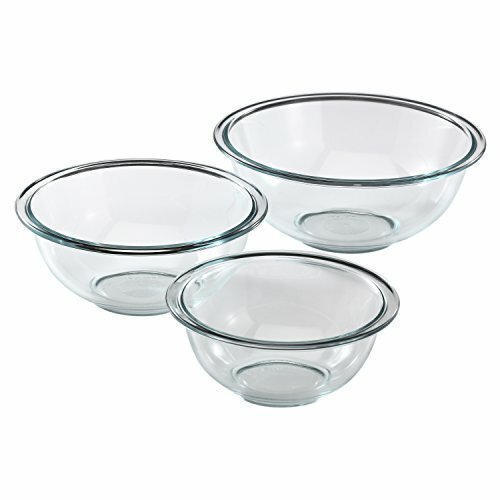 Take them out and let your cookies cool.